If you are looking for cheap hotels in San Diego or a bigger choice than the listed one below, the ‘Hotel Circle’ along Interstate 8 is offering some variety. But be prepared that these hotels are located (with little exceptions) along a 12-lane highway!!! The upscale seaside resort is located at San Diego’s northern city limits. The accommodations are pricey, but by staying here you are getting away from the city’s hustle and bustle. From $98 (low season) - $189 (high season). The European-styled inn has 23 rooms and is located at Prospect Street, 2 blocks from the ocean. La Jolla’s shopping and restaurant district is around the corner and La Jolla’s sights are in walking distance. From $130 - 145. The Empress Hotel is in the downtown district, close to the ocean and all sights. Its amenities include a fitness room and the rates comes with a complimentary breakfast. $185 – 320 (king room). The small waterfront inn is located at La Jolla Cove. Most rooms have either a partial or full ocean view. The breakfast is simple for a B&B but you cannot beat the location. The Mission Bay consists of a salt-water lagoon with tiny marinas. Many hotels and resorts surround the lagoon that is located close to the ocean. All hotels either face the waterfront or are just steps away from the beach. 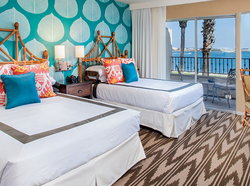 Private rooms from $65 – 85 (depending on the season). The hostel has a deck overlooking the beach and a large BBQ grill where you can prepare your dinner or enjoy the sunset. It’s just a few steps away from Pacific Beach. $85 – 250 (depending on the room and season) + parking. The Dana is a marina resort at Mission Bay’s South Cove. Guests have the choice between a standard motel and more fancy hotel rooms. The grounds offer two pool areas; one located in a lush tropical garden the other at a bay promenade. Check Expedia.com or other third parties for rates under $100 per night. $250 – 400 per night. The contemporary luxury hotel sits at Pacific Beach. Most rooms face the ocean or pool area. During the evenings the pool area is turned into a bar/lounge. Shelter Island is a former sandbank that was turned into an artifical island. It belongs to Point Loma, a seaside neighborhood in San Diego. On the island and close to the sport harbor you have several hotels and eateries. From $129 (low season) - $400 (high season). The beach-style hotel is located at Shelter Island’s tip and yacht harbor. It’s the only hotel with a private beach in California. 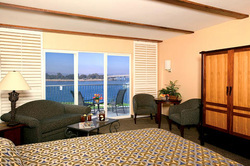 Besides rooms you can book boat slips for the marina as well. $99 (low season) – 159 per night. The Sheraton frames a yacht harbor at the bay and is not very attractive from the outside. However, the grounds are nice and you have a waterfront in front of the hotel with some eateries around. The historic state park in San Diego contains many old buildings that date to the 1820s to 1870s. The area around the state park is known for a quaint Mission style and offers many Mexican restaurants and latinamerican shops. $99 (low season) – 149 per night. The hotel is nicely located above Old Town with lush courtyards and gardens. The hotel comes in a Hispanic architecture and offers a swimming pool, Jacuzzi, and gym. $108 (low season) – 144 per night. The hotel is located in the heart of Old Town and comes with a swimming pool and courtyard. The rate includes a complimentary breakfast. ​Within San Diego’s downtown you have another historic district, the Gaslamp Quarter. In the 1860’s this area was known as the New Town related to the Hispanic Old Town. Nowadays it is a popular entertainment, and restaurant strip, which is close to the bay with its many marinas. From $28 for a dorm bed - $130 for a private room (high season). The hostel is located in the Gaslamp Quarter and has private rooms, 4 bed and 10 bed dorms. The rate comes with breakfast, hot drinks and free WiFi. $135 (low season) - $300 (high season). The luxury hotel in the Gaslamp Quarter has modern and contemporary rooms and offers a very nice pool area that is transformed into a lounge and bar during night. The rate comes with a daily wine hour from 5 – 6pm. $200 – 300. This modern business hotel belongs to the Intercontinental Group and is in walking distance to the convention center, Gaslamp Quarter and Seaport Village. Check 3rd parties (Expedia, Travelocity, etc.) for lower rates. ​Coronado is a wealthy town and popular resort destination south of San Diego’s downtown. The island is known for its endless beach that is listed under the 5th best beaches in the US (rated by The Travel Channel). The most famous building on the peninsula is Hotel Coronado, which was built in 1888. The downtown district features many shops, restaurants and entertainment. $179 – 229. The olld fashioned Hispanic-style B&B is known for a great service and friendly staff. 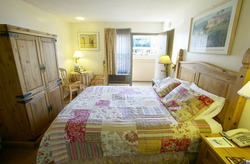 The Lodge is just a short walk away from the beach. $150 (special offer) - $279. The resort is located at the southern end of Coronado Island on a small penisula. It faces the inner bay and the area around Chula Vista. Check third parties for special offers (Expedia, Travelocity,…).